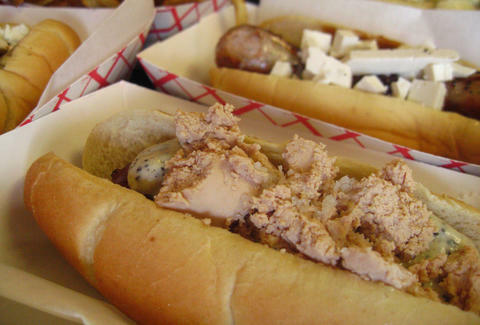 Hot Doug's, the beloved (and dearly missed) Chicago institution helmed by our fearless Sausage King, Doug Sohn, is returning for what is billed as two days of all-you-can-eat sausage and duck fat fries glory this summer as a pop-up festival on the city's West Side. Here's the deal. Sohn has teamed up with Goose Island Beer Company to launch the hot dog festival called The Dog Dayz of Summer, coming this June 27th and 28th, where attendees can get their hands on a special lineup of Hot Doug's sausage sandwiche favorites and its famous duck fat fries -- all served up by Sohn himself with a side of chit-chatting with customers, according to the official announcement. Tickets, which went on sale Monday morning, will cost you $75, but will score you as much Hot Doug's deliciousness as you can eat during the two session times available each day, noon to 3pm and 5pm to 8pm. There will also be plenty of Goose Island beer and live music. The festival is produced by the same people who put on Do Division and Wicker Park Fest, and will take place at Goose Island Barrel Warehouse at 605 N. Sacramento in Humboldt Park. Oh, and if you can't wait until summer to finally get some Hot Doug's goodness again or don't want to pay for tickets, there's another brief opportunity on May 16th at the Paulina Meat Market and Sohn will be there. Tony Merevick is Cities News Editor at Thrillist and wants to dive into a pile of duck fat fries right now. Send news tips to tony@thrillist.com and follow him on Twitter @tonymerevick.